Trials with their price incentives are always very nice and while a trial in just four exchange areas will clearly not help the majority of our readers it is still worth mentioning. If you live or work in the Whitchurch (Cardiff), Corstorphine (Edinburgh), Childwall (Liverpool) or Swinton (Salford) areas then an Openreach trial with reduced monthly pricing for two years and free install of GEA-FTTP may be of interest - though it is dependant on your chosen retailer taking part and whether they will pass the savings on. The key parts of the trial are that for a period of 12 months from 1st March 2019 a trial will run on the four exchanges that have seen extensive Fibre First FTTP roll-out. Rental costs will be £15+VAT/m irrespective of whether a 40/10, 55/10, 80/20, 160/30 or 330/50 Mbps service is ordered and the connection charge is £0. The trial is billed as a way of letting communication providers test migrations to the GEA-FTTP platform, but we also believe it offers a good opportunity for newer Openreach installation engineers to do a good number of installs in a short time frame and thus become experts at all the quirks that crop up in real homes. Whitchurch and Childwall have already been covered in our news previously, but the two other exchanges were new to our checker, so while the trial was announced on 1st February as we wanted to get a good number of the premises that can take part into our checker and on the maps it has taken us a couple of days. 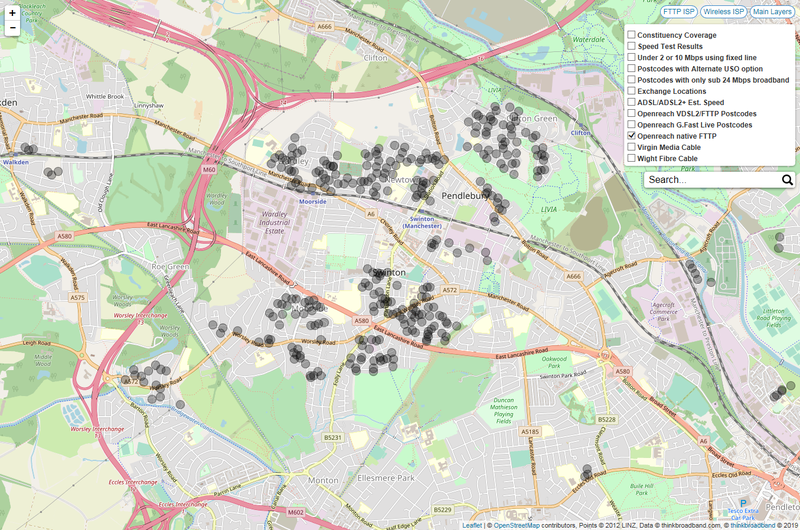 Postcodes with Openreach FTTP in the Corstorphine area of Edinburgh, there is more but this is what we have mapped so far. Some may worry this trial is evidence of Openreach trying to skew the market, and if this trial was to expand to cover subsequent exchange areas then they may have a point, but we would guess that the trial is going to appeal to a provider such as Sky who after announcing selling GEA-FTTP has not been rushing to visibly be selling the service, rather than say BT Consumer who have been selling and migrating people to the FTTP services for many years. In terms of pricing the £15/m is actually more expensive than the £7.40/m GEA-FTTP 40/10 transition product (transition means existing copper remains in place for voice services and you need to pay line rental for that) service, but you do save the £92+VAT connection fee. Therefore the trial offer price suggests it should be compared to the Data Product Variants, where no copper is required and any voice service would be delivered over the FTTP, the 40/10 data product is £15.79/m and the savings are higher as the service speed increases. One quirk of the Ofcom rules around what price Openreach can charge for its FTTP is that in areas where a FTTC 40/10 service is available the prices we have mentioned above apply, but if an area where the FTTC 40/10 service is not available, the price is actually lower at £12.27/m for the data product variant. The idea as we understand it is that in areas with access to the basic VDSL2 speeds the price for the FTTP is higher so that competitors are not priced out of the market, and this means that Ofcom while it does not control trial pricing will be keeping a close eye to make sure that the trial is not used as a stealth way for Openreach to bypass the charge controls. The Openreach FTTP footprint that we are tracking has of course increased even though it is only a couple of days since the last summary when the BT Group published its financial results and the numbers have jumped from 728,778 premises to 741,646 premises in just 4 days (around 1,200 premises are from new build and around 400 are BDUK rural broadband roll-out). The Corstorphine exchange area already had a number of G.fast pods and the pattern of overbuild of G.fast established in Whitchurch is being repeated. 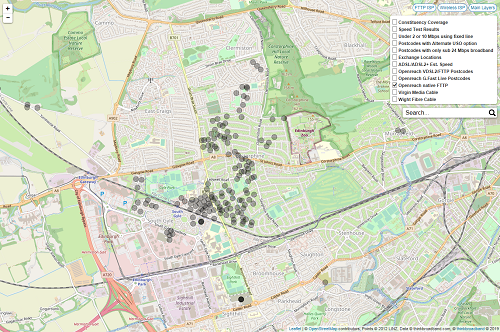 Swinton is much more straightforward, but for those without VDSL2 in other urban parts of the UK there is a glimmer of hope as we are seeing some exchange only lines and others without a VDSL2 twin on their cabinet now with a FTTP option. Update 6th February: We have updated article to reflect that that the contract term for those ordering FTTP as part of this trial is not 24 months, but the usual minimum contract periods apply. The 24 months originally mentioned refers to the period of time the lower FTTP price will apply, the free connection charge is only available for those orderiing in the first 12 months. 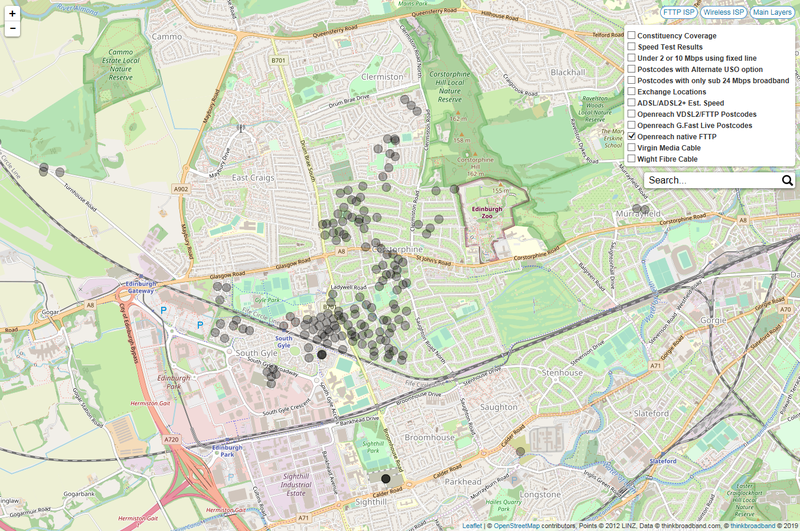 The map images are also now out of date as we have found a lot more FTTP in both Corstorphine and Swinton (part of Salford District). The pace of the FTTP additions has been such that we have been updating the Openreach FTTP map layer daily for the last week or so, the images comprising the map layers are usually only updated monthly. Suspect the trial is around the data product variant, so includes 'line rental' but only in the sense of having no live copper in the property. Corstorphine FTTP looks to be the model for other wealthy suburbs - they're also installing it in parts of the southwest of the city. Gfast is mostly in areas with higher population density, presumably cos of shorter lines? They need to do something like this in new-build areas where there is direct competition with Virgin Media. On our estate, and on most other new developments in Derby, FTTP and VM are offered in parallel, and most people go with VM thanks to their more attractive pricing and marketing, even though Openreach FTTP is a better product.